Every instrument produces a different sound and we in McNeela Music know that ultimately the quality of sound is determined by the workmanship and materials used. Our instruments are constructed with great patience, passion and precision with smooth playability being our most essential objective. 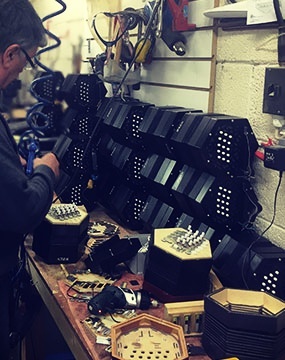 We handcraft a great portion of our instruments to the highest of standards using the most premium materials and we also have a large range of Bodhrans, Concertinas, Violins, Guitars, Banjos, Flutes and Whistles to choose from. Irish Concertinas By McNeela The Anglo concertina has been a popular Irish traditional instrument since the early 20th Century. It has been said that almost every house in Ireland had a concertina which was usually kept in the chimney corner nook! The concertina is still as popular as ever and we have some beautiful concertinas to choose from. All of our Concertinas for sale are designed and constructed to perfection and in accordance to the historical models of the iconic Wheatstone and Jeffries. For many years we have been gaining valuable knowledge and experience on the construction and restoration of historical concertinas. Our selection includes concertinas which are suitable for both beginner and professional players. Some of our most popular concertinas include, The Wren Anglo Concertina 2 which produces a crisp tone, has adjustable leather straps, a nice wooden ended finish with black 6-fold bellows, pearl white buttons, it has become one of the most favoured concertinas by music teachers and is often used in the learning and teaching of traditional Irish music. The Phoenix Irish Concertina has been specifically developed for traditional Irish music, it is a 30 button Anglo C/G concertina with all the features you need to play quality trad music, it’s a perfect fit for intermediate players. If you are looking to purchase a traditional Irish bodhrán you have come to the right place. We have been making great bodhrans for 37 years. We have a fantastic selection of Tunable and Non-Tunable Bodhrans. All of our bodhráns are handcrafted and constructed to the highest of quality by the Bodhrán Maker himself, Paraic McNeela. Some people think the way in which bodhráns are made is unimportant, however this is the most important aspect of any bodhrán as the construction and materials used determines the quality, life span and sound. 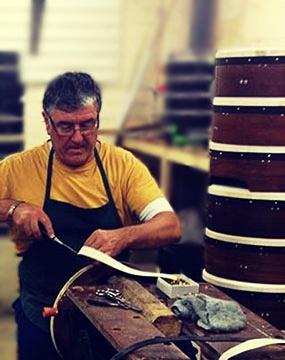 When the bodhrán maker is handcrafting the instrument he has to make 23 different decisions along the way. When constructing a bodhrán its all about the finer details, every minor element of the bodhrán is constructed with precision. We know that the finer details are what evokes that amazing beat, so a bodhrán maker must ensure careful thought and skill go into each one. Here’s just some of the bodhrán we have to choose from, a beautiful Rosewood Deep Rim 16” Tunable Bodhrán which is designed to be light and to provide a deep tone, this bodhrán is the pinnacle of modern bodhrán making, our 16” Deep rim Tunable Bodhrán is the most popular bodhrán among our professional customers, its 6" deep, 16" wide rim and produces a remarkable tone, the tuning system allows for greater tonal control and it allows you to adapt the instrument to its surroundings, we also have a great 14” Non-Tunable Bodhrán which is made from goatskin and produces a remarkable tone. All of our products have been carefully selected as we only choose the best quality. We pride ourselves on always offering a premium collection of products to our customers. We believe our instrument collection is evidence of this. 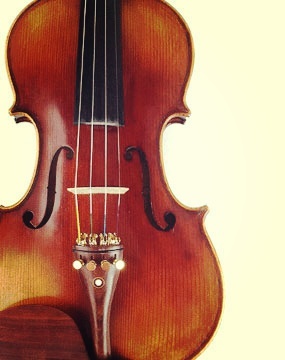 We have a wide selection of new and antique violins including some of the most beautiful violins to choose from, all of our historical violins have been professionally restored and have been modernised to meet the needs of contemporary players. We make our own violins beginning with the McNeela Student 4/4 Violin, this is a full size student violin which is perfect for students and beginners. It features an ebony fingerboard, a solid top of spruce with fine grain down the front with good quality strings, it produces a good quality tone and great volume. The McNeela Maestro Violin is handmade and one of our most popular products, its handmade and features a solid top of spruce and close grain which produces great sound, it has great quality German Lenser Protos strings. We were lucky to acquire a H.T. Barry 18th Century Or Early 19th Century Full Size (4/4) Violin, which is from the late 18th century or early 19th century full size (4/4) violin, has a nice neck graft and a one-piece back, it has a lovely mellow, deep and mature sound. We know that every flute has their own unique strengths and we only stock flutes which have these attributes. We have a large range of handcrafted flutes, every aspect of the flute has been built using the most premium materials, during construction our flutes have been trialled and tested, every bolt is carefully selected and attentively put together. Favourites include The Cygnet (Rosewood) Flute, this is our most popular flute it has incredible ability to inspire intermediate students with it’s easy to achieve tone and resonance control. 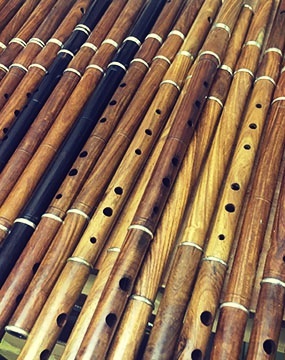 The McNeela African Blackwood Flute, has a full bodied resonance with a strong timbre tone, it is made with African Blackwood which is a very dense hardwood, dense enough to sink in water, it is finely-textured and has a very smooth finish when polished. The Blackwood Flute is highly comparable to more expensive blackwood flutes and at its current price point it beats all of our other premium flutes on sale hands down. The Des Seery Flute has the consistency of the material, it keeps it’s rich tone throughout the year with no surprises just before a show, no the need to worry about oiling the instrument or getting the dreaded cracks in the barrel, with professionals such as Tom Doorley of Danu and Eamonn de Barra of Slide having recorded on a Seery Delrin flute, it is easy to see why more and more people are keen to get hold of one.